For many years I believed that Devil May Cry was an Xbox exclusive game, as I had never seen it in game stores for my console of choice at the time, the Playstation 2. 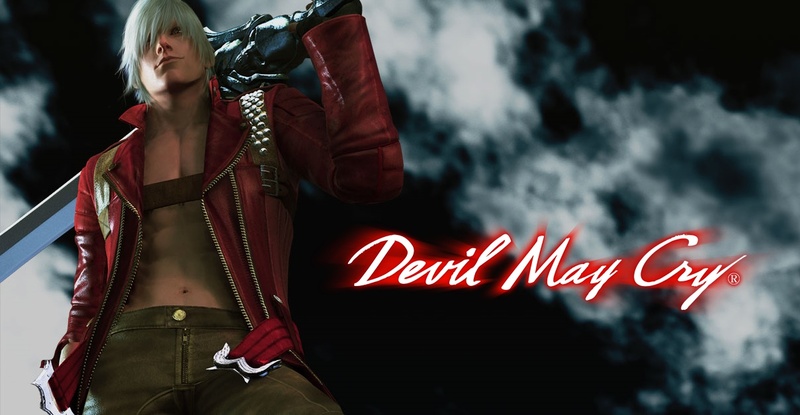 My unfortunate lack of having played Devil May Cry may have been a blessing in disguise, otherwise I might not have been as intrigued about the series as an adult. Having only played less than an hour of the game in my youth, I had no real expectations going into this game. A clean slate to dive into. So what did this game have that made it such a classic? What would make this game such a treasure to own now? And did a few HD touch ups make the game truly one to stand out? Does it truly shine now? Devil May Cry HD Collection (Game #1) was received free as a Twitch Prime subscriber, much to my very pleasant surprise. I opened the game and wondered what treats and goodies lay in wait. 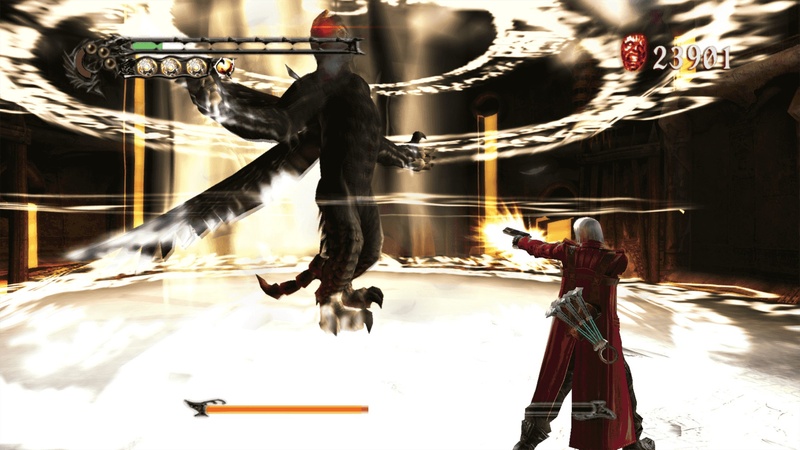 The title screen was a beautifully rendered triple-shot of Dante, the game’s protagonist from each of the first three games. Each Dante was separate, but they shared a background. It looked pretty cool. I expected a traditional game options menu where sound, graphics, etc. were concerned and was a touch disappointed. Controls for the keyboard, and, to my joy, gamepad were peachy, as were the sound options. Nothing spectacular, but at least they were what you’d expect from a relatively up to date game. But once the graphics screen was pulled up, I nearly dropped my controller at the lack of options. There was simply resolution, anti-aliasing, screen mode (such as border-less or full screen), and brightness. This game was supposed to be be an HD version of the game, so why did it feel so bare boned? These concerns hit me before I even opened the game and scared me. What other let downs could I expect from what is known as one of the more well loved games in the ‘classic’ hack and slash genre? 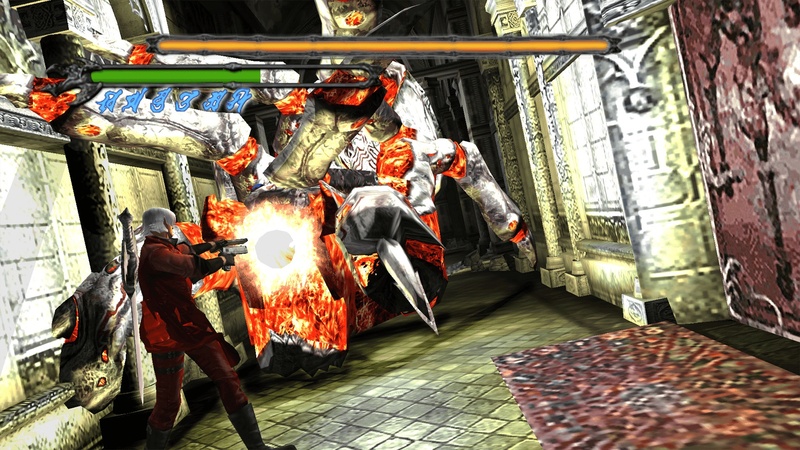 Devil May Cry has a combo based combat system where you use different combinations of buttons to do various attacks. If you are someone like me who only tends to remember combos in fighting games, there is an ‘easy auto’ mode which allows for much easier execution of advanced combos. 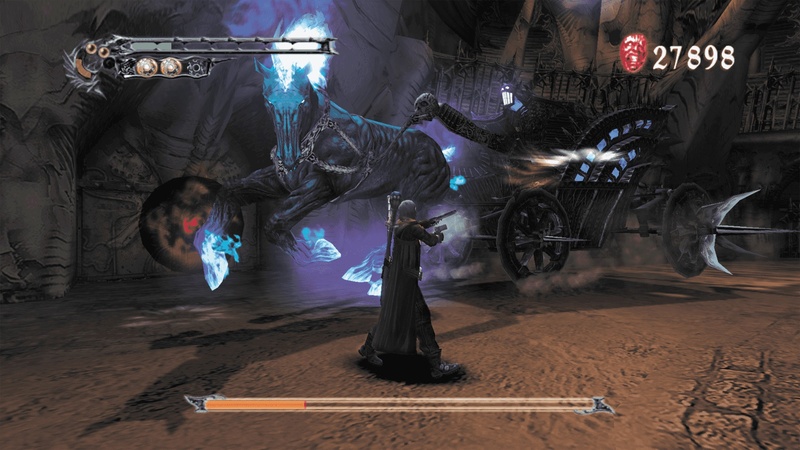 You initially use sword techniques for up close and personal combat, but you can also use Dante’s twin handed gun setup or big honkin’ shotgun – much to my joy as I tend to stay away from the scythe wielding phantom-like creatures or creepy possessed marionettes as much as possible. The game also lets you ‘Power Up’ for lack of a better term with the flick of a finger. I pressed one button and all of a sudden my plain looking bullets took on a purple hue with a stream of purple lightning following in its wake. Or I could use the gauntlets that allow for fiery attacks rather than electric based attacks. The gauntlets also create a much different set of moves. A melee combat system that slows down the game play to a minimal degree to see each strike hit rather than just the usual flurry of moves you’d see in this type of game. You can power up each weapon and purchase items with red orbs you pick up along the way, including recovery items and continues for non-combat actions.. Then there are upgrade options for each weapon that allow you to do more advanced combos, such as fly back and forth as an attack. Once the upgrades are purchased, they are permanently ‘equipped’ to that item. There are even moments of first person underwater combat although, while using a specialized ranged weapon, the powered up form did not activate underwater. While the underwater combat was not very intuitive, it was still enjoyable in small doses. Great stuff. This game is also notoriously puzzle happy. It’s not as bad as one might think if they have the patience to look around for a bit. Might be a spot on a floor that needs to be pressed, or a hidden piece of jewelry that needs to be placed. Maybe pulling an Excalibur maneuver and removing a sword to replace it somewhere else. Almost every stage has some sort of puzzle that needs to be solved in order to go further in your quest. Whether platforming to the top of a tower to find a sword you shouldn’t be able to see unless you turn to just the right angle, or a side stage where you have to kill one hundred spider like creatures in a very short amount of time without using weapons. It’s a blast, but sometimes very frustrating if you are not a fan of puzzles, or like me, refuse to get help from Youtube (said with a wry grin). While I could go on about the awesomeness of the overall gameplay and how fun it is with a light learning curve, the neat wall jumping mechanic, and the awesome glowing lightning-like attacks, it’s time to discuss the elephant in the room. There is one thing that stops this game from being amazing, and it’s heartbreaking really. The game has some decent artwork in it, okay backgrounds for the time of the original release, fun platforming, but what it does not have is… wait for it. CAMERA CONTROLS!!!! The game would be a hundred, no a thousand times better with just a bit of added camera controls. I tried on the gamepad, AND I broke my solemn vow to never game with a keyboard and tried to find the slightest chance of camera controls. I found nothing, zip, nothing, nada. Go down a corridor and the camera switches to another angle, and that would be fine if the switch wasn’t so sudden. Maybe a gradual rotation to the next viewpoint. Many a time had I ended up going back down the same hallway because I could not figure out which way Dante was initially facing. Not having camera control in a third person game in a 3D world was not the easiest to navigate. The game’s music, while not my personal cup of tea, oddly worked in this world of magic and mayhem. It was what I would call a combination of ‘techno and chill.’ Sometimes the music was a bit intense, then sometimes there was no music at all, but whenever crap was about to hit the fan, the music was a clear indicator to focus. Something big, something, mean, or something crazy is coming your way, and you didn’t have but a few seconds to prepare. Sound quality was good. No concerns there. Overall, I’d say Devil May Cry HD Collection is a gem, at least based on my experience with the first game in the series. It’s not perfectly polished. It could have had a few more things done to make it better, such as smoothing out certain visual edges on characters. The camera controls… Yeah. Not nice beating a dead unicorn. It’s great fun if one doesn’t mind the many puzzles and battling lots and lots of possessed marionettes. If this game is on sale, I would say grab it. It’s a decent game for its time, but it could have been so much better if a little more elbow grease went into this ‘HD’ remake. I’d give this a 3 out of 5. It has a lot of things going for it, but the few things that it has going against it are glaring and hard to let pass. Keep your heads up gamers, Game on!